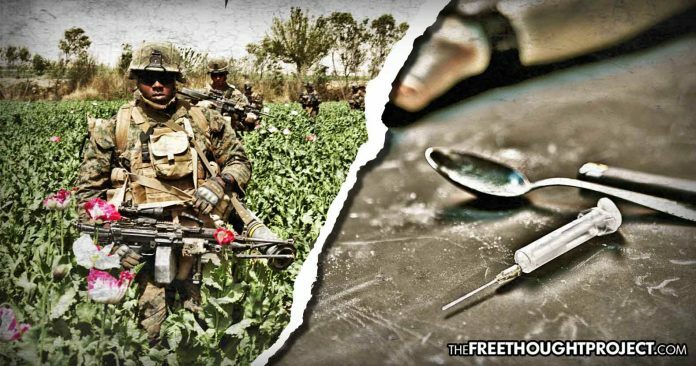 As the longest war in United States history approaches yet another anniversary, the U.S. is being forced to admit that after pouring billions of dollars into counternarcotics efforts in Afghanistan, the result has been an overwhelming increase in opium production. The reality is that if the $8.62 billion the U.S. has spent on countering drug production and trade in Afghanistan has actually helped it immensely, then the U.S. is literally undermining the reconstruction efforts it claims to have spent the last 17 years pursuing. The record-setting poppy cultivation levels just happened to coincide with a significant increase in United States troops stationed in Afghanistan. U.S. troops have been caught guarding the plants, fueling the belief that the U.S. government cares more about controlling a major cash crop than it does about defeating terrorismneither of which the U.S. has any business trying to control. The impact of U.S. intervention has been staggeringfor both American and Afghani civilians. Under supervision from the U.S., Afghanistan is now responsible for producing 90 percent of the worlds opium supply, and the massive increase in production has fueled an on-going opioid crisis in the United States that has ensnared more than 2.5 million Americans in heroin addiction. As whistleblower and former FBI contractor Sibel Edmonds noted, before the U.S. invaded Afghanistan in 2001, there were around 189,000 heroin users in the United States. By 2016, that figure increased to 4.5 millionan estimated 2.5 million heroin addicts and 2 million casual users. The idea that the Afghanistan War has any kind of humanitarian purpose can be debunked just by looking at the current results and how much civilians have suffered from enduring the effects of years of U.S. intervention. More than 31,000 civilian deaths have been documented, and it should be noted that over the last few years, civilian deaths have substantially increasedwhich serves as a reminder that the situation is only getting worse. The latest report from SIGAR clearly states after 15 years no counternarcotics program led to lasting reductions in poppy cultivation or opium production. Instead, U.S. efforts have actually contributed to opium production and made the problem worse. The report claims that improved security, governance, and economic growth are needed to make a lasting difference, which means that after spending more than $1 trillion, the government still believes throwing money at the problem is what is needed to solve it. Wonder how much of the billions of those dollars have found their way into the swiss bank accounts of US politicians, deep state members, etc ?? ?